The Burger King wonder-kid is becoming the CEO of the chain’s owner. Restaurant Brands International, parent company of fast-food staples Burger King, Tim Hortons and Popeyes Louisiana Kitchen, said Wednesday that Daniel Schwartz, 38, will assume the role of executive chairman effective immediately. Assuming the CEO spot at Restaurant Brands is Jose Cil, who has been Burger King’s president since 2014. Cil has touched most of Burger King’s operations around the world for some 18 years, making the appointment logical. Josh Kobza, Restaurant Brands’ chief technology officer for the past year, was also promoted to chief operating officer. Prior to becoming CTO, Kobza was the company’s chief financial officer for four years. A source close to the matter told Yahoo Finance the succession planning process began last summer. Schwartz will take a larger role at Restaurant Brands’s backer and private equity powerhouse 3G Capital. Schwartz knows 3G Capital well — he joined the company in 2005 and managed its private equity arm until 2010. Schwartz told Yahoo Finance he will remain “very, very active” with Restaurant Brands. The position shift for the admitted numbers cruncher — who is known for living on airplanes, traveling around the globe to Burger King locations — will likely spur speculation that 3G Capital is gearing up for a major acquisition. All hands on deck, so to speak. But Schwartz said nothing is imminent. The leadership change marks a rather remarkable end to an eight-year journey atop Restaurant Brands for Schwartz. He was appointed CEO in his early 30s and tasked with building out Restaurant Brands’s portfolio. The somewhat reserved Schwartz did just that — taking the global restaurant count to 25,000 from 12,000 and spending $1.8 billion to buy Popeyes in 2017. Yahoo Finance talked with Schwartz and Cil about their new roles. The interview has been edited for length and clarity. 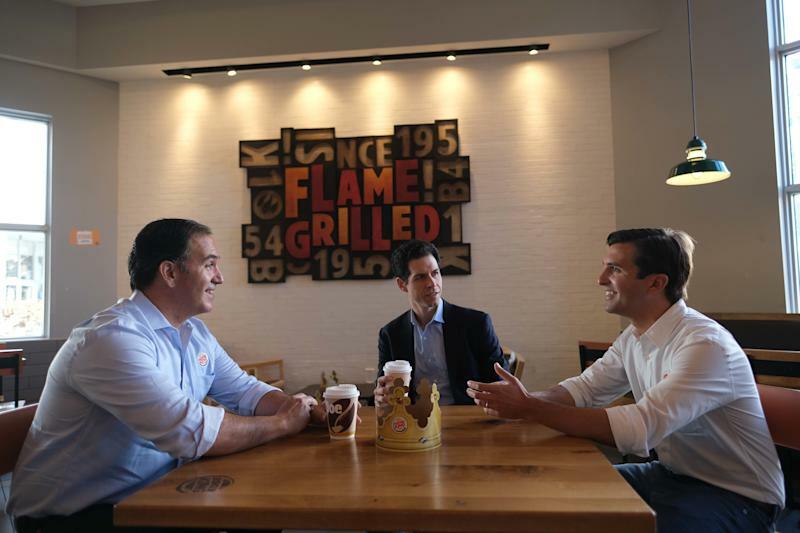 Daniel Schwartz (outgoing Restaurant Brands CEO -- center); Jose Cil (new Restaurant Brands CEO -- left); Josh Kobza (new Restaurant Brands chief operating officer -- right). Yahoo Finance: Last time we talked you pretty much said you were living out of airplanes traveling the globe visiting Burger King locations. Why did you make this decision? Daniel Schwartz: The only people that sleep on more airplanes than I do are in the room with me here. I tell you Josh and Jose I think their schedules might be even crazier than mine. Jose managed to go to four continents four or five times last year. Josh has already been back and forth to Brazil a couple of times in the last few months. What we love about this business is that it’s global and has incredible partners everywhere. We enjoy spending time with them in their markets working side by side. For us, that’s how we have been able to stay so close to the business and make the right decisions. Yahoo Finance: And on the timing? Schwartz: When you take a step back it’s really just a natural evolution of the roles that we have already been playing over time. Jose was beginning to manage the relationships of our global partners who are developing Burger King, Tim Hortons and Popeyes. This is a natural transition. Also the Burger King brand has had such success under Jose’s leadership in Europe and now more globally. In Josh’s area, he has been instrumental in developing a lot of these partnerships that have been successful. We have made more progress on technology under Josh than we had in the past many years before that. Josh could bring a lot of value in bringing a lot of this under his oversight. We are excited for what the future holds. We have a ton of confidence in the long-term outlook for Restaurant Brands. Yahoo Finance: Is this also you planning for the next stage of your life and career? Schwartz: I was pretty blunt on our conference call today. I am not planning to be the CEO of another company. That’s not in the cards for me. I will be a very, very hands-on chairman at Restaurant Brands. I will still be traveling to the different markets. I will spend more time in my capacity as a partner at 3G looking at some of the other investments they have and some prospective investments. Yahoo Finance: You’re a numbers guy. 3G Capital is a deal-maker. Are they nearing a deal and they asked for your help? Schwartz: No. I have always served as a partner since 2007. I will spend more time being involved in the other areas in which 3G is involved. There is just so much potential in Restaurant Brands. I am still excited to be a part of it. Yahoo Finance: Jose, tell us a little about yourself. Jose Cil: I studied law at the University of Pennsylvania. I joined Burger King as a lawyer back in 2000. Right after the acquisition of Burger King by TPG I moved into operations. I spent about six months in restaurants training back then. Then I moved into my first operations role in North America. I had similar roles internationally, traveling all over the world. I moved to Europe for a general manager role and then came back to the U.S. and ran company stores. I then left the company for a short while and joined Walmart for about 11 months. And then 3G acquired Burger King and I had a chance to connect with Dan and 3G and they invited me to come back and put the company on the path that it’s on today. I rejoined in 2010. The rest is history. The last eight years I have had a chance to view the basis for our brand, one of meritocracy. The idea that those that perform and deliver have the chance to do more. I have been an example of that. Our goal for Restaurant Brands is to build the most loved restaurant brand in the world. I think we have an amazing portfolio of iconic brands that are in the early stages of growth globally. We are fundamentally a growth company. Yahoo Finance: So like Daniel, you are also living out of a suitcase. Cil: Yeah. I spend quite a bit of time on airplanes. I am involved in our businesses globally. I plan to continue that moving closer to the other brands as well. Yahoo Finance: Plan for your first 100 days? Cil: The focus will be making sure we have the right people in the right roles with the right priorities and objectives. I think we have a great team. I will be working closely with our franchisees at Popeyes and Burger King and Tim Hortons. Yahoo Finance: Daniel took the restaurant count to 25,000 from 12,000. Can you get it to 45,000 or more? Cil: I worked shoulder-to-shoulder with Daniel on getting to that number. We don’t have any specific targets we want to focus on. We just want to have happy guests and profitable franchisees. We have a lot of work to do. We are early days.